Unless your procurement experience comes from living on a remote island where the principal means of trade are focused on bartering goods and services, you will have come across supplier information management in some form. Beyond the supplier management basics, as companies move past the closed registration threshold to open registrations and self-management with workflow and broad integration with other software investments to reuse and enable MDM throughout the enterprise, what should they expect to achieve, and what should they require from solution vendors? These questions are at the core of understanding not only what advanced supplier management can deliver, but also which technology partners to work with. Yet before addressing these topics, it is important to consider the characteristics of the organizations that should take SIM further. This paper explores in significant detail advanced use cases for supplier management including those based on advanced open registration, advanced closed registration, finance, legal, and operational intersections, business process outsourcing and politics/regulation requirements. Whether you’re just getting started with supplier information management and want to explore what’s ultimately possible or you’re looking to move a current program and implementation to the next level, we encourage you to download this advanced compass series research paper. 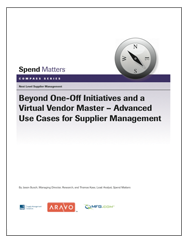 To get your free copy of Beyond One-Off Initiatives and a Virtual Vendor Master, please complete the short form below. Members: Skip the form and log in to grab your free copy.